In some parts of the world you can find fences that stretch for hundreds of miles, delimiting protected areas or those populated with humans. The basic reasoning is that these fences are put in place to protect the local wildlife by preventing the spread of diseases, poachers and by helping helping managed endangered populations. The reverse may actually be true, according to a study published in the journal Science. Livestock and wildlife don’t mix well, so farms and local governments have established extensive fencing systems to ward of contact between the two and stop diseases like foot and mouth from spreading. These sort of fences, hundreds of miles long, are particularly common in South Africa. Researchers at Zoological Society of London report, however, that the effects produced are actually counter-intuitive. The fences disrupt predator prey dynamics, such as the case of African wild dogs who have learned to chase they prey into fences where they become cornered. Fences also limit herds from grazing grounds, as elephants and wildebeest are now unable to reach the vast areas of land they require to support their population. A lot of people promoting the use of fences advocate that the most and foremost, these need to be put in place to separate human civilization from wildlife, which actually gathers local support for one reason or another. The study notes, however, that these aren’t that practical and most situations. After studying 37 fences in Southern India, researchers found that almost 50 percent failed to prevent the passage of elephants, demonstrating the difficulty in designing and maintaining fences. 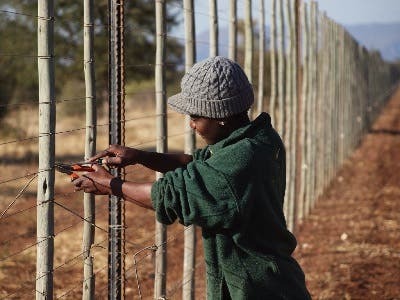 “In some parts of the world, fencing is part of the culture of wildlife conservation – it’s assumed that all wildlife areas have to be fenced. But fencing profoundly alters ecosystems, and can cause some species to disappear,” said Rosie Woodroffe, lead author of the study. It’s a bit naive to think that fences keep poachers out. Ironically, many fences come as a ready supply of wire for making snares. The scientists involved in the study advise that a better design and implementation of fencing is warranted, and only in areas where these are necessary. “An increased awareness of the damage caused by fencing is leading to movements to remove fences instead of building more. Increasingly, fencing is seen as backwards step in conservation,” concluded study co-author Sarah Durant, also of the Zoological Society.